Written by admin. Posted on November 17, 2015. Filed under Exhibitions. 2 Comments. The Royal Museums of Fine Arts of Belgium and the Louvre Museum come together to present an ambitious and innovative project inspired by Jacques Attali’s essay A Brief History of the Future. The two independent yet complementary exhibitions are articulated around the same questioning. By interrogating the future – at the Louvre by an observation of the past, in Brussels by a prospective approach – they analyse the great dynamics that cross and animate societies, from their origins up to the horizon of 2050. The exhibition at the Louvre aims to project itself into the future based on a subjectivereading of the past, pictured and shaped by the artistic creations from the previous millennia. On their side, the Royal Museums of Fine Arts of Belgium hinge on the topicality of current artistic creations in order to question a series of societal themes – from globalisation to the commodification of time, from over-consumption to the well-being of the planet. Through these artworks that transcend the big societal questions, the visitors are invited to reflect on the future they are supposed to shape. With: Hiroshi Sugimoto, Alighiero Boetti, Bodys Isek Kingelez, Andy Warhol, David LaChapelle, Andreas Gursky, Hans Op de Beeck, Yang Yongliang, Gavin Turk, Francis Alÿs, et al. Written by admin. Posted on November 26, 2014. 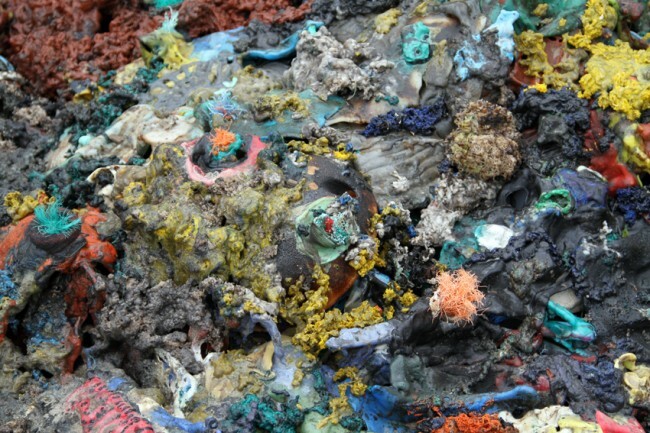 Filed under Exhibitions, Plastic Reef. Tagged Exhibitions. 1 Comment. With: A. Aycock, A. Barrios, I. Bonillas, L. Camnitzer, J. Chicago, L. Echakhch, M. Vanden Eynde, P. de Fenoyl, Y. Friedman, D. Ghesquière, L. Ghirri, J. Grossmann, J. Hilliard, J. Jonas, M. Laet, B & M. Leisgen, R. L. Misrach, F. Nakaya, J. Luzoir, K. Paterson, G. Pettena, J. Pfahl, R. Signer, R. Zaugg. Does the Meteor bring good tidings? There is no day, no daily news, no radio station that doesn’t bring us the weather report. The wind eternally plays with the clouds, the sun with the moon, while the rain trit-trots with the hail. The addiction to weather reports is said to be particularly widespread in the West, where the temperate climate compels us to revisit the forecast several times a day. Whether this is simply a game or real existential angst, there is no doubt that climate exerts a considerable influence on our behavior. This exhibition revisits the vague and rather Eurocentric Theory of Climates, and reveals the uncertainties of the Anthropocene Era. The featured works are, by extension, also open-ended, mobile, and plural. Reactivations, interpretations, and reinventions, these works break with the rule of unity and veracity. Let’s open our imagination to the sensation of the wind, of snow, and the aridity of the desert! Written by admin. Posted on March 7, 2014. Filed under Exhibitions, Plastic Reef. No comments. With: Ansel Adams, Adam Cvijanovic, Olafur Eliasson, Noriko Furunishi, Chris Jordan, Edward Burtynsky, Agnes Denes, Mark Dion, Chris Doyle, David LaChapelle, Maya Lin, Ana Mendieta, Robert Morris, Dennis Oppenheim, Allan Sekula, Robert Smithson, Alan Sonfist, Michelle Stuart, Maarten Vanden Eynde, Marion Wilson, ea. In 1969 the legendary Earth Art exhibition took place at Cornell University. A new kind of exhibition, curated by Willoughby Sharp, it presented site-specific installations by nine international artists, scattered around the Cornell campus and the surrounding Ithaca landscape. Responding in part to consumerism, mass media, and the insularity of art in the late 1960s, these installations were also shown in the context of a developing international environmental movement. It is at this intersection—where art meets life—that the influence of the 1960s earth artists has perhaps had the most significant impact on a current generation of artists working on issues related to the environment and sustainability. With metaphor, humor, and direct action, artists are able to represent ideas and reveal patterns often hidden beneath the surface by merging rational observation with beauty, creativity, and inspiration. 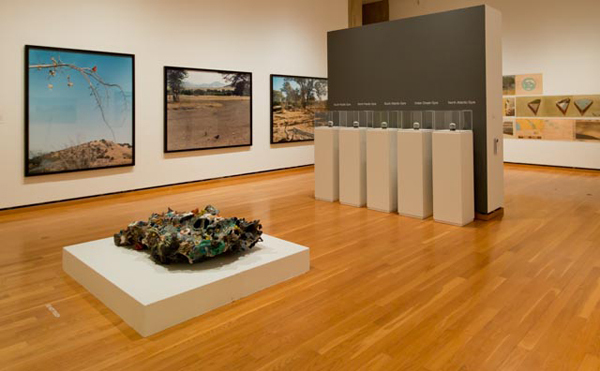 Comprising separate installations and exhibitions that address issues related to the representation of landscape, water supply, food justice, recycling, fair distribution of natural resources, and the nature/culture divide, beyond earth art • contemporary artists and the environment is on view in all of the Johnson Museum’s temporary exhibition galleries and lobbies, as well as outside the Museum on the façade and grounds. The work included operates in the gap between the objectivity of scientific data and the subjectivity of creative expression, signaling the interconnectedness of the themes addressed. Written by admin. Posted on March 29, 2013. Filed under Exhibitions. Tagged Exhibitions. No comments. Yes Naturally is an international art event initiated by Stichting Niet Normaal under the artistic direction of Ine Gevers. The key question in Yes Naturally is ‘What is natural, and who or what decides?’ Are human beings the only ones to have a say or do animals, plants and inanimate objects also have a role to play? The exhibition will offer a thrilling tour of the natural world, including both clichéd images of romantic landscapes with waterfalls and the hard and inescapable facts of environmental degradation. It will wake us up to the reality of oil slicks and genetically modified fish, but suggest that solutions to environmental problems can be found if we are prepared to change our habits: through recycling and new kinds of cooperation we can save the planet. Artists will propose new and unconventional approaches. The exhibition will include work by Francis Alÿs, Jimmie Durham, Olafur Eliasson, Atelier van Lieshout, Zeger Reyers, Superflex, Ai Weiwei and others. More than 80 artists will use this grand-scale exhibition to present surprising partnerships between humans, nature and technology. The results are both liberating and hilarious: you can design your own pet, fungi turn out to be our best friends, you can harvest the city and seagulls are quite tasty on the barbeque. But also: your smartphone is your memory, Facebook is your habitat, internet the new biotope and nanoparticles have become an integral part of our existence. Written by admin. Posted on March 8, 2013. Filed under Plastic Reef, Seminar. Tagged Seminar. 1 Comment. In this seminar which is organised in the framework of the exhibition of Plastic Reef we will look at the influence of plastic pollution from a future perspective through lectures by marine scientists, activists and an artist. Maarten Vanden Eynde who will lead the seminar is a visual artist who worked for five years on the realisation of a monumental sculpture made up of plastic debris coming from the five ocean gyres, locations where plastic is accumulating because of the existing ocean currents. 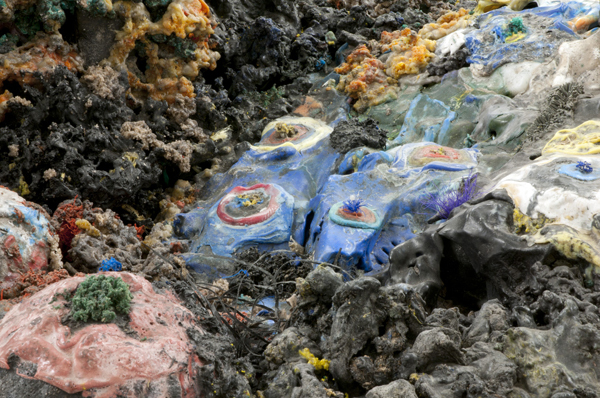 The sculpture Plastic Reef (2008-2012) has the characteristics of a coral reef, with all its nooks and crannies. However, more than hinting at what could be lost as a result of all the plastic in our oceans, it is a possible physical but surrealistic solution to the threat that plastic in the oceans pose to the marine environment. 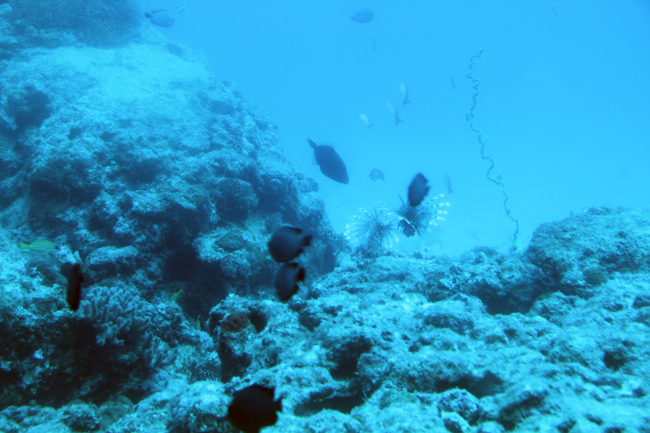 The importance of marine environments to living beings, as well as land environments, is frequently under communicated. In light of this, we can see Plastic Reef as tangible proof of what scientists and ecologists are trying to make known through research and publication. 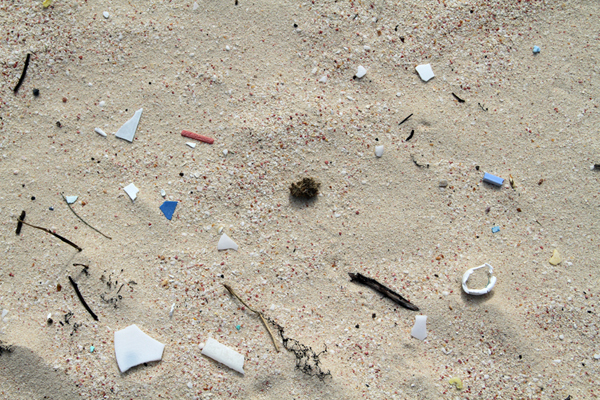 In this seminar we will look at the influence of plastic pollution from a future perspective. As plastic will create the fossils of the future, we are interested in short and long term effects, as well as mapping what is currently happening with the plastics that are floating in the world oceans. 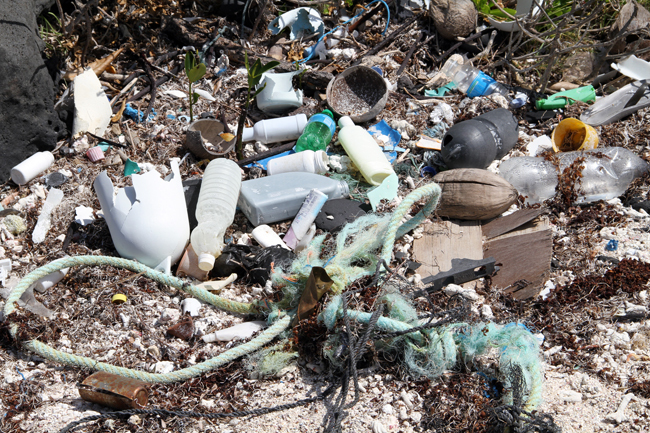 What are the global effects and implications of plastic presence in our environment? What is the possible threat for us, as the initial creators of this new material? And what will be our legacy? What will be our ‘Remnants of Tomorrow’? 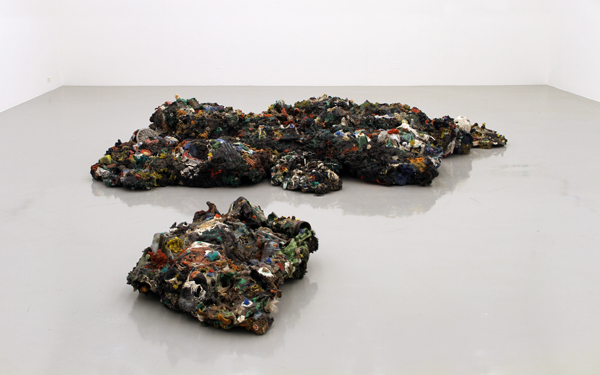 As is poetically, yet matter-of-factly, described in Nav Haq’s text The Age of Plastic and After, published on the occasion of Maarten Vanden Eynde’s exhibition Plastic Reef, the proliferation of plastic in our world will lead to long-term damages. 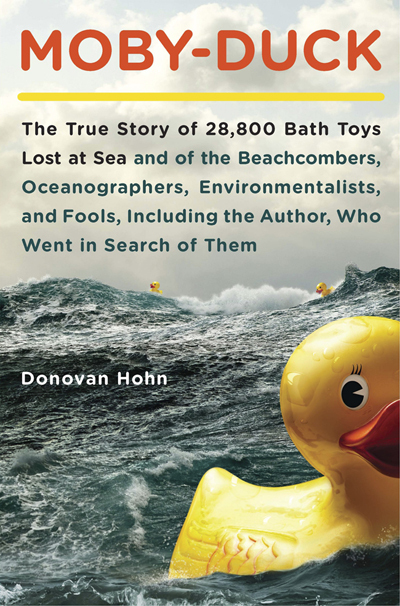 The text is concluded with this sentence: And the return of plastic into the ocean was eventually seen as symbolic of a cycle of failure, and, with it, of the delusion of the modern era. The seminar will be held in English. Participation is free and open to all. To secure a seat, please notify us of your participation before Wednesday 6th of March by e-mail: hks [at] kunstsenter.no. Maarten Vanden Eynde is an artist who has devoted his life to exploring the mysteries of our future past by investigating the concept of Genetology, a self-invented ‘Science of First Things’ (www.genetology.net). His work is situated exactly on the borderline between the past and the future; sometimes looking forward to the future of yesterday, sometimes looking back to the history of tomorrow. He studied Free Media at the Gerrit Rietveld Academie in Amsterdam, The Netherlands. His postgraduate studies have included a year at the Mountain School of Arts in Los Angeles, USA, and two years at the Higher Institute of Fine Arts in Ghent, Belgium. In 2005 he founded the organisation Enough Room for Space, a mobile platform for site-specific projects, together with Marjolijn Dijkman. Kevin Thomas is an environmental scientist who for the past 8 years has worked at the Norwegian Institute for Water Research (NIVA) as Research Manager for Ecotoxicology and Risk Assessment. His expertise lies in understanding the fate, behaviour, effects and risks of man-made substances in the environment and provides advice to national authorities and the EU. He is a highly cited author of over 100 peer-reviewed scientific papers that include reports on how particles behave and impact the aquatic environment. Kevin will coordinate a recently funded Research Council of Norway project ´Microplastic impacts on the marine environment (MIME)´that is due to start in late spring 2013. Chris Carroll has been working on the issue of marine litter for the past three years for Seas At Risk, the European association of NGOs working to protect and restore to health the marine environment of European seas. Its members include Friends of the Earth Norway. During his time at Seas At Risk Chris has been involved in, and presented several submissions to EU and UN bodies that have looked at the problem of marine litter, and he is one of the co-authors in a recent EU publication ‘Marine litter: Technical Recommendations for the Implementation of MSFD Requirements’. At present Chris is co-ordinating two studies being carried out by Seas At Risk, that aim to evaluate the potential of legislation to tackle the problem of marine litter. Chris has often been quoted in the media regarding the topic of marine litter and at Seas At Risk. He is also responsible for communications activities. Marcus Eriksen is currently the Executive Director and co-founder of the 5 Gyres Institute. He studies the global distribution and ecological impacts of plastic marine pollution, which has included expeditions sailing 35,000 miles through all 5 subtropical gyres to discover new garbage patches of plastic pollution in the Southern Hemisphere. In 2000 he travelled to Midway Atoll, finding hundreds of Laysan Albatross with plastic pouring out of their stomachs, and that experience narrowed his focus to plastics. He received his Ph.D. in Science Education from University of Southern California in 2003, months before embarking on a 2000-mile, 5-month journey down the Mississippi River on a homemade raft of plastic bottles to bring attention to this issue. 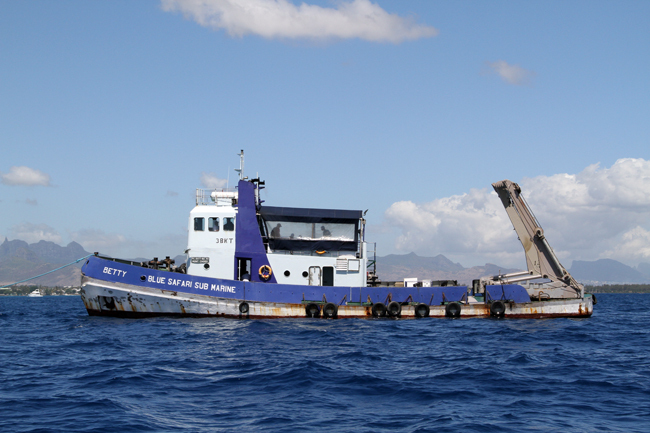 Again in 2008, he rafted across the Pacific Ocean from California to Hawaii on JUNK, floating on 15,000 plastic bottles and a Cessina airplane fuselage as a cabin (junkraft.com). 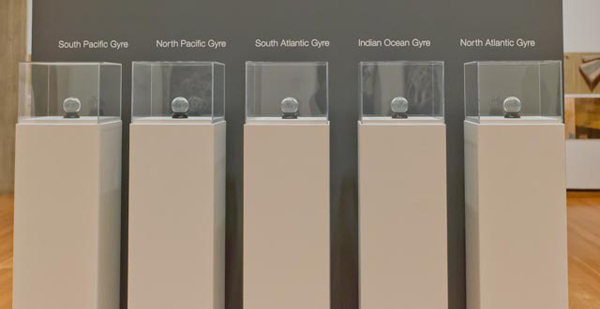 The journey, 2,600 miles in 88 days, brought attention to the work of the 5 Gyres Institute, the organization he co-founded with his wife Anna Cummins. The 5 Gyres Institute is committed to marine conservation through continued research, education and adventure, studying and lecturing about the plague of plastic waste in our watersheds and global ocean. Written by admin. Posted on January 11, 2013. Filed under Exhibitions. Tagged Exhibitions. No comments. HORDALAND ART CENTRE based in Bergen, Norway was established 1976 as the first artist run art centre in Norway. Its activities are based around the exhibition programme with equal emphasis on seminars, presentations and dialogue. Since 1987 HORDALAND ART CENTRE has hosted a Nordic residency programme, from 2008 also open to international artists, curators, writers and other art professionals. Nav Haq wrote a text for the exhibition. It is the first magical substance which consents to be prosaic. But it is precisely because this prosaic character is a triumphant reason for its existence: for the first time, artifice aims at something common, not rare. And as an immediate consequence, the age-old function of nature is modified: it is no longer the Idea, the pure Substance to be regained or imitated: an artificial Matter, more bountiful than all the natural deposits, is about to replace her, and to determine the very invention of forms. A luxurious object is still of this earth, it still recalls, albeit in a precious mode, its mineral or animal origin, the natural theme of which it is but one actualization. Plastic is wholly swallowed up in the fact of being used: ultimately, objects will be invented for the sole pleasure of using them. The hierarchy of substances is abolished: a single one replaces them all: the whole world can be plasticized, and even life itself since, we are told, they are beginning to make plastic aortas. There was little regards for the lifecycle of plastic, as the zenith of the Plastic Era occurred in the period known as the twentieth century – after the era of objects fashioned directly out of natural materials, and before the era of objects designed to be a Spime. Plastic seemed to have embodied the modern egalitarian dream by transforming something taken from nature into a myriad of possible objects for the everyday. Its invention proffered a sort of alchemy, forming infinite derivatives to match the aspirations of the twentieth century, with its technological advancements and its diversification of lifestyles. Its profound rise meant the uses of plastic entered every aspect of life in a celebration of its own prosaic, mechanically-reproduced abundance. The very idea of its own artifice was embraced somewhat reflexively in culture, and even the term ‘plastic arts’ was adopted simultaneously as a moniker for the art of the day. 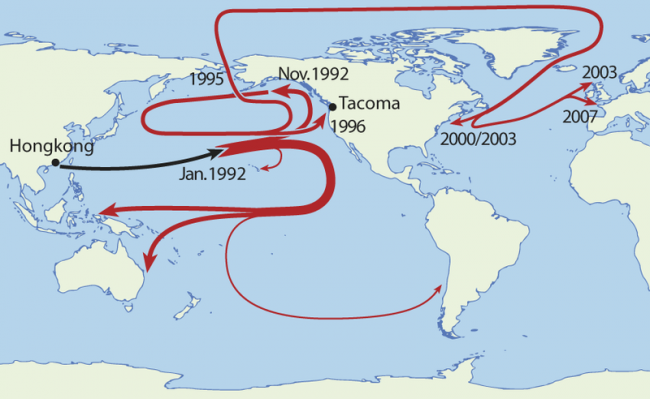 The question remains as to why exactly human subjects returned plastic to the sea. At that time the material did not degrade and remained permanently in the ocean, creating a toxic floating landmass. Born of the petroleum that was formed from the plankton that emerged in the Earth’s primordial sea, the return of plastic polymers to the ocean was nothing other than an aberration. This ‘return’ to the ocean was ultimately an act against the idea of a lifecycle, as there was nothing to digest or transform it into something organic. It was as if simply removing it out of the sight of culture, and into the realms of the unknown, was enough. It was only after this point that the lifecycle of manufactured objects became a design issue. The Spime was conceptualised at the beginning of the twenty-first century by the renowned science-fiction writer and design theorist Bruce Sterling. It comprised a progressive vision towards the kind of object that can be tracked throughout its whole life and through space and time. Objects could be traced from the point of their first virtual representation, to their manufacture, their subsequent ownership history, their physical location, right through to their eventual obsolescence and decomposition to raw material, ready to be used for making a new object. Objects were created to be recorded and archived in real time, thus being traceable at any given moment. ‘Things’ were never the same again. The development of the Spime marked the acknowledgement of the new Human-Centred approach to design, and the new status given to objects in term of their use, meaning and value that followed brought us into the next age. From then on, all items were classified into two grand categories: 1) Human-Centred, those objects within the frame of human design and reference, and 2) Object-Centred, those objects that had their own existence outside of human acknowledgement or legitimation, within the realm of nature and the universe. The Human-Centred acknowledgement of the existence of objects became an evolutionary design understanding. It was a revolutionary paradigm shift that required us to move away from the disregard of total object lifecycles towards the design of total object lifecycles. Human-Centric design would be tested against its effects on the Non-Human-Centric sphere. 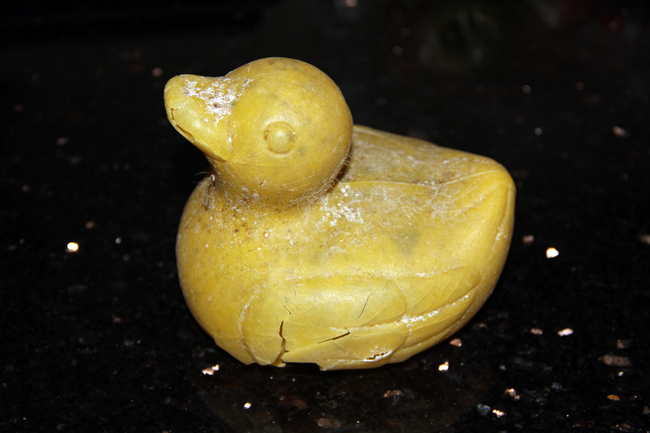 Yet in the timeline of humanity it was the age of plastic that had the biggest effect on the Non-Human object world. The over-abundance of plastic objects was created in a context of non-acknowledgement towards the world outside of the human sphere. The oceans in particular being the ultimate place, furthest away from civilisation, that became the dark abyss for everything humanity wanted to discard. 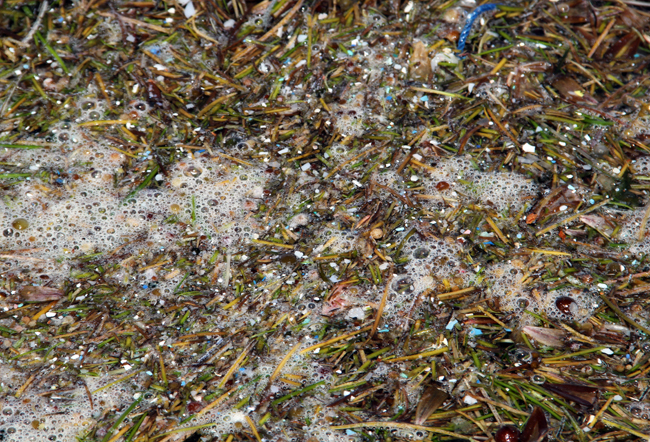 Giant concentrated masses of marine litter outweighing natural plankton many times over. Through a cruel irony, its molecular structure meant its brittleness would cause it to photo-degrade into fine grain-like pieces, much of them sinking, much of them floating, entering the food chain by being unwittingly digested by sea life. 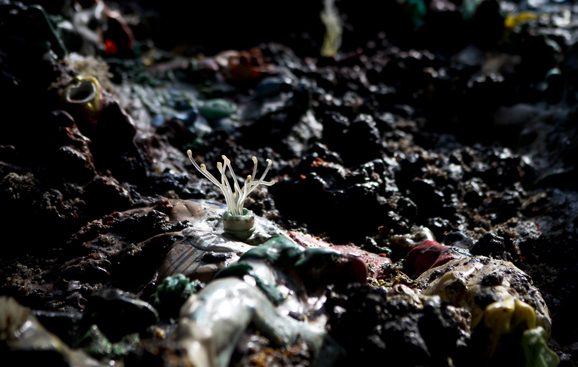 There were only rare instances in which this existing plastic would get collected and reused, such as by modest but well-meaning eco initiatives or businesses, and even by investigative artists – literally for ‘plastic art’. The great paradigm shift, in its essence, was verbalised in an accord that stated that for a truly symbiotic existence between humanity and the universe, it was essential that things needed to exist and flourish outside of human knowledge and interference. It was also clear at this point of transition that this new era of design would cause a wholesale reassessment of the conditions created by Late Capitalism. Commodities would be only one stage in a complex cycle of materiality and non-materiality for objects, without further requirement for anything to be discarded. The economy shifted from being driven by the deliberate short lifespan of commodities, to being driven by the sustainment of the cyclicality of commodities. And the return of plastic into the ocean was eventually seen as symbolic of a cycle of failure, and, with it, of the delusion of the modern era. For Bruce Sterling’s compelling thesis on the Spime and its place in the future of design, read: Bruce Sterling, Shaping Things, MIT Press, 2005. This takes directly from the idea of ‘Object Oriented Theory’ that was outlined by the philosopher Graham Harman in his book Tool-Being: Heidegger and the Metaphysics of Objects, Open Court, 2002. This theory describes itself as a metaphysical movement that rejects the privileging of human existence and anthropocentrism over the existence of non-human objects. It is also worth reading entries related to this subject on his blog: http://doctorzamalek2.wordpress.com/. Written by admin. Posted on September 5, 2012. Filed under Indian Ocean Gyre. Tagged Indian Ocean Gyre. No comments. Mauritius is surrounded by one of the largest coral reefs in the world. It is however in very poor condition due to beach erosion and human impact ranging from the use of fertilizers to the overload of sewers from the endless hotels that are build for bulk tourism. 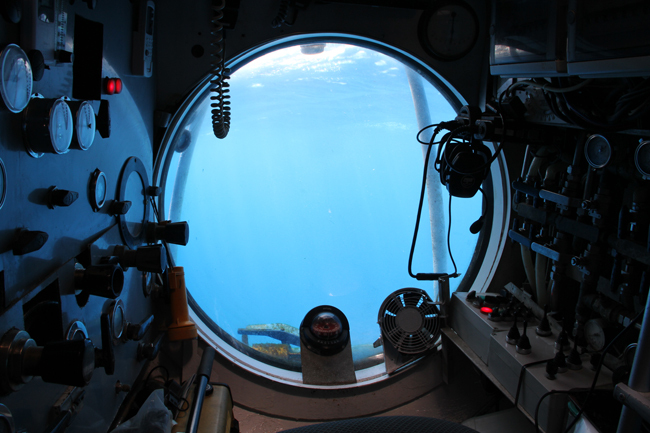 I join the Blue Safari 1100 submarine to have a look. It only took 5 minutes on the launching boat to remember the time on the Sea Dragon in 2010. The water was rough and I had to go to the toilet. Especially when you try to stand still it becomes even more evident that you are constantly moving. I lean hard against the wall and stick on to it to create some stability and try not to pie on my pants. Oh sweet memories! We go to the diving boat pretty soon and once under water everything is calm again. With every meter that we descend the colours are fading and our faces start to look purple. It has been experimentally established that seawater alters different colors in the same way as a blue lens. Ultraviolet rays reach farthest, whereas infrared ones are absorbed literally centimeters under the surface of the water. At a depth of 5m water lets through up to 45% of the blue sector of the spectrum, in the same time absorbing up to 60% of the red sector. That is why the surface layer looks blue-green. 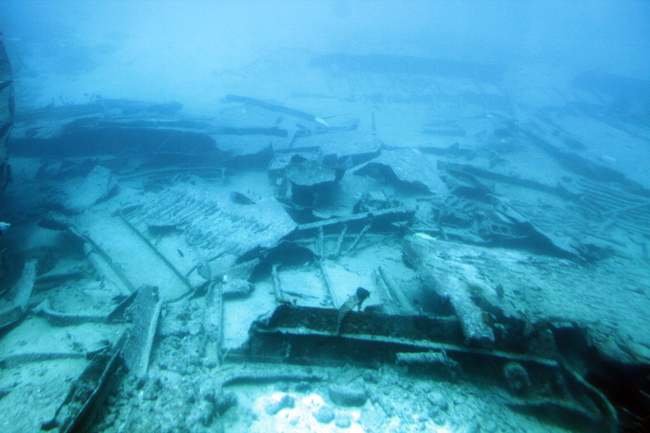 We go up to a depth of 35 meters and see a huge ship wreck, one of the 14 that is deliberately put on the bottom to create an artificial reef. It looks just like a pile of junk. 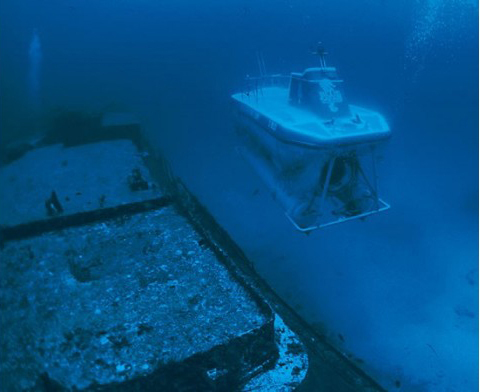 That it takes 50 years before this metal dump becomes a real reef is apparently not an objection. We see a lot of different fish including Moorish Idols, the dangerous Tigerfish, and a slimy Golden Eal. 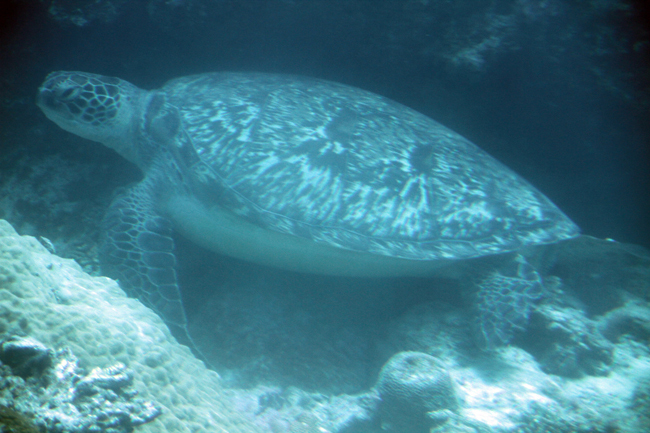 While trying to get as close as possible to a giant turtle the submarine cracks of a piece of coral. Hey well, it only takes another 50 years or so to grow it back…. Written by admin. Posted on September 2, 2012. Filed under Indian Ocean Gyre. Tagged Indian Ocean Gyre. No comments. It’s supposed to be paradise on Earth and I have to say it comes close. 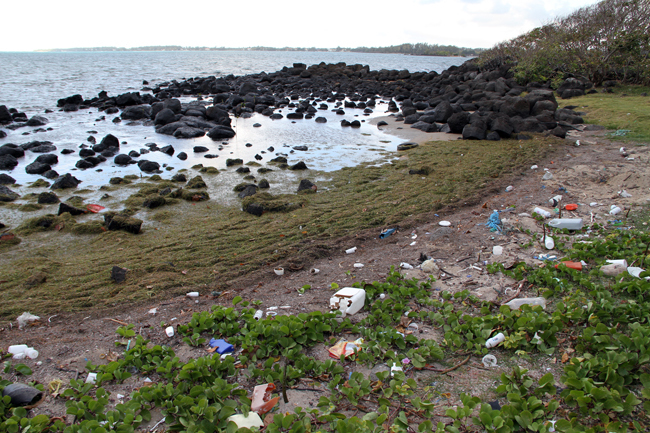 The island of Mauritius, named after Prince Maurits van Nassau from the Netherlands, is located on the west side of the Indian Ocean Gyre, the last of the five gyres I’m visiting to collect plastic debris for the growing Plastic Reef sculpture. The island is only 65 by 45 km big but has almost 1.300.000 inhabitants. This mix of different cultures (French, English, African, Indian, Chinese) and different religions (Hindu, Muslim, Christian) makes Mauritius a very colourful and diverse place but is also the incentive for not being paradise (anymore). 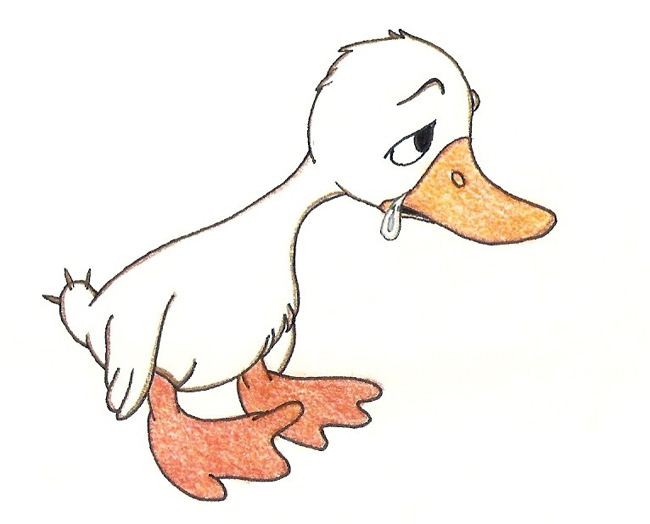 After the Dutch, French and English colonised Mauritius (in that order), put the Dodo to sleep for ever and imported slaves from different locations to work on the sugar cane plantations, it was left alone to become independent in 1968. A big part of the mainland is still used as plantation and the island is covered with asphalt roads connecting one city to the next. A lot of ‘prestine’ beaches are private property. Big hotel chains and Spa resorts promise you the last glimpse of paradise but they have to work hard for it. 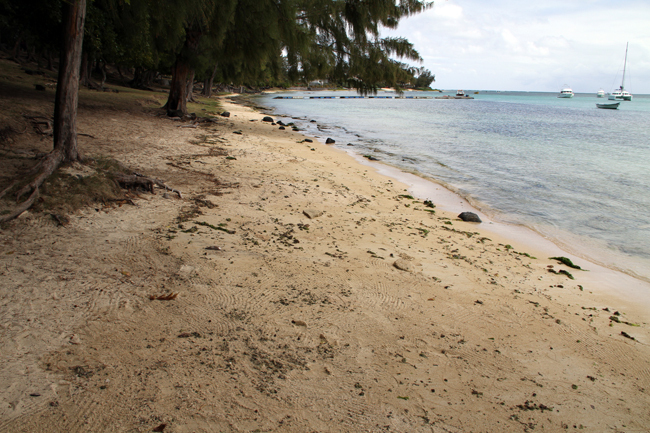 The beaches are constantly overrun by plastic debris of which at least half is land based, meaning: coming Mauritius itself. Only tourists see it as paradise, the locals just want to eat KFC to go and leave the remnants on the beach. 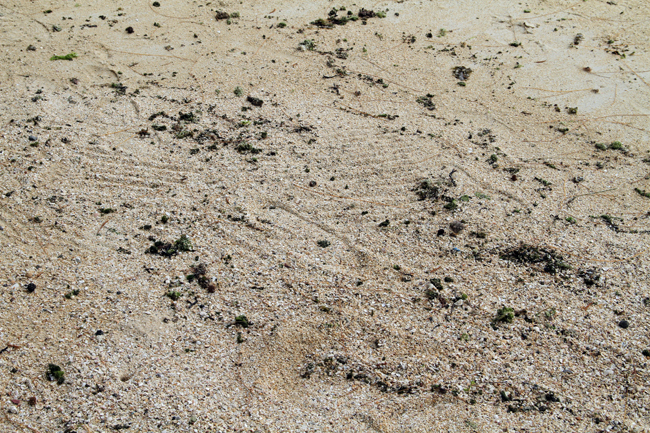 The public/touristic beaches are cleaned daily by orange suited beach cleaners (look at the traces in the sand on the left). 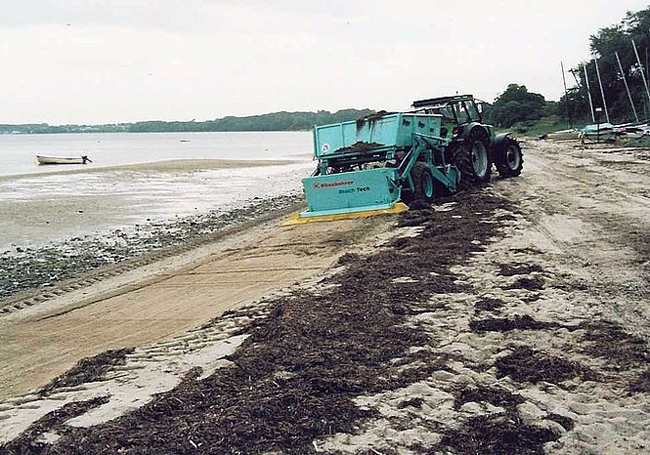 They still do it by hand because most of the beaches are inaccessible for big machines like the BeachTech 3000 which is gaining enormous popularity worldwide. I could fill up a bag with this pile of rubbish alone. 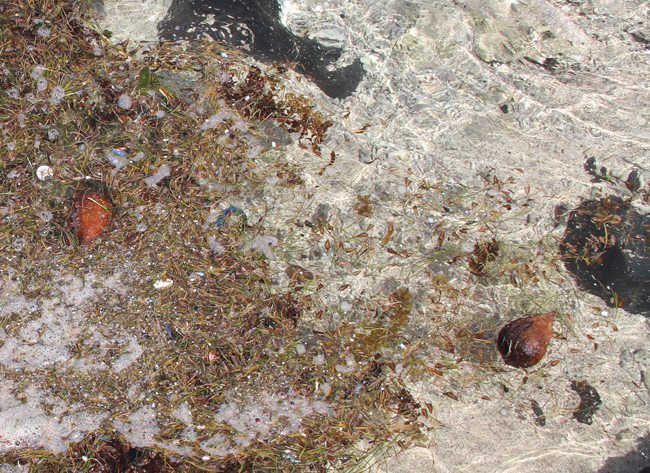 In the water in between the seaweed, leaves and coconuts there’s even confetti à volonté! Can’t see it? Get closer! I wonder what kind of machine will filter these ones out…. Written by admin. Posted on August 23, 2012. Filed under Exhibitions. Tagged Exhibitions. No comments.